Google chrome is the one application that runs throughout the day in my system. The simple and fastest browser has always filled with full of tabs and mostly uses my half of the system resources. I continuously open new tabs to get more topics for this blog to share with you and also to read some designing resources. However, Keep opening and having more tabs in Google Chrome will slow down the browser itself. Even sometimes the system will slow down and affects your system performance. When you have more than 10 Chrome Tabs, It is difficult to find the correct website in the browser. To fix all these problems, install the ‘One Tab’ Google Chrome extension. “One Tab” is the most essential Google Chrome Extension. It is indispensable for all chrome users who have the low system resources and have more than 10 active tabs. It basically converts all of your tabs into a list in a single tab. It will free up the memory used by the Google Chrome tabs. After that, Your Google Chrome browser will run fast and smooth without any glitches.In addition, your system will not slow down and will run much faster than before. 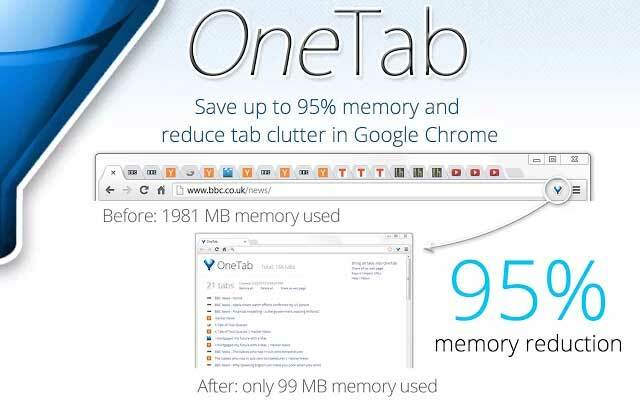 OneTab claims that when you use this extension in your chrome, it will reduce system memory usage up to 95%. After you have installed the One Tab, Just click the icon of OneTab in the side of Address bar. It will close all your Chrome Tabs and lists that website tabs in a single tab. If you want to access the tabs again, you can either restore them individually or all at once.Also, you can close the tab within that one tab, by clicking the X icon. OneTab provides the import and export options. Using that you can import and export all the URLs in the OneTab List. In addition, you can share the whole list of URLs as a single web page link or QR link. Using this feature, no more copy and paster thing of Bunch of urls, just create single webpage link and share with anyone you want to share. It’s Pretty easy!